Scottish clans have a long and often bloody history. They have been in existence since the ninth century, and almost destroyed by the English in the eighteenth century, but despite that, today they are flourishing with members all over the world. One reason that they have endured over the centuries, despite numerous attempts to curb them, is the fact that they afford their clansmen a sense of family. In fact the word clan, taken from the Gaelic language literally means "children of the family". They are structured in such a way that the Clan Chiefs are officially registered with the court of the Lord Lyon, King of Arms, which controls the heraldry and Coat of Arms. They are usually identified with areas of land, which would originally have been under the control of the Clan Chiefs. Often these lands will have an ancestral castle or manor house, many of which are still occupied today, by the current Clan Chiefs. clan map of Scotland will enable you to locate them. Modern Scottish clans have their own distinctive clan tartans, which are often seen as a badge of membership. clan badge as part of their Highland Dress, to show allegiance to their Chief. An enterprising Scottish company www.vfdesigns.com are producing luxurious cashmere and lambswool sweaters and cardigans, for both men and women, with your clan crest beautifully embroidered on the chest. Elliot Clan. They are a Scottish Border Clan, who showed allegiance to King Robert The Bruce. Robertson Clan who also fought with King Robert the Bruce at Bannockburn. And clan gatherings held on a regular basis, encourage clan members from many different parts of the world to come together, ensuring strong social ties. One very special gathering took place in Scotland's capital Edinburgh, in June 2009. The Gathering, saw members from all Scottish clans coming together as part of The Scottish Homecoming, to celebrate the two hundred and fiftieth birthday of Robert Burns, Scotland's National Bard. The Gathering, was officially opened by His Royal Highness, Prince Charles. One of the visitors to this site was kind enough to write an article, which he then submitted to me for publication, detailing his account of The Gathering. Jim from America, has a very strong Scottish heritage, on both sides of his family, and is of course a member of one of the Scottish clans. He has made a considerable contribution to this web site, not only with his article, but also with many photos he has very kindly sent me, one of which you can see below. 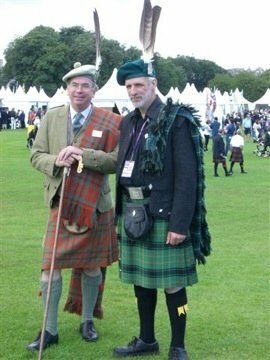 This photo shows two clan Chiefs attending The Gathering, notice the eagle feathers being worn on their caps. Such feathers may only be worn by a clan Chief. In the early days social ties were established in quite an extraordinary manner. It was common practice for the Clan Chief's children to be brought up by their mother's brother (an uncle in another clan), and his children likewise would be brought up by their uncle, in yet another clan. Although to us this would seem very strange, back then it brought about intensely strong social bonds, and reinforced inter-clan ties. As a community a Scottish clan is distinguished by heraldry, and recognized by the Sovereign. And as such is considered a "noble incorporation" because the title "Clan Chief" is a title of honor in Scotland, and the Chief confers his or her noble status onto the clan. Therefor all clans with recognized Chiefs, are recognized under Scottish law. Historically a Clan Chief could add to his clan simply by adopting other families, and legally had the right to outlaw anyone from his clan, including members of his own family. Nowadays anyone with the Chiefs surname is considered a member of the clan, and similarly anyone who offers allegiance to a Chief is considered a member of the clan, unless the Chief does not accept that person's allegiance. Clan membership goes through the surname, therefor children who take their father's surname are part of their father's clan and not their mother's. However it is becoming common practice for people to claim clan membership through their mother's side of the family, simply by offering allegiance to the Clan Chief. Nowadays many Scottish clans have a list of septs, which are surnames of families who through historical ties are associated with the clan. So even if your family name doesn't have a clan connection, your surname may well be a sept of a clan. Confusingly though many sept names are shared by many clans, and you may need to do a bit of digging into your family history, to discover which clan you are associated with. If you need any help discovering which Scottish clan you belong to, you can drop me a line using the "Contact Us" page, and I will be delighted to help.